For some reason, lately I’ve been staying up late and catching a bit of the late night talk shows. I must admit that I’m more of a Dave fan than a Jay, but I generally enjoy both of them. The stars they have matter more than the host, but I digress. For some reason, last night I was watching Jay and just happened to enjoy Jackie Evancho’s performance on the Tonight Show. Pretty impressive as always. The song was perfect for her. She still waves her arms in funny ways which I guess is a bit endearing since she’s still being herself. It’s part of who she is now. The most amazing thing was when Jay said that Jackie Evancho’s first album “O Holy Night” had already sold over 1 million copies. Props to Jackie Evancho. No wonder she could turn down the chance to perform at Carnegie Hall. She’ll have more opportunities to do that in the future. America’s Got Talent’s Jackie Evancho performs O Holy Night from her debut CD. Just wanted to give advanced notice to all jackie fans that she will not be performing with Tim Janis at Carnegie Hall this December. This was not an easy decision and we wish that things could have been different. Can you imagine making these tough decisions? Seems like they’re doing their best to take care of Jackie since she is so young. I certainly applaud these efforts. Hard to imagine passing up Carnegie Hall though. That’s pretty amazing. Last night, Jackie Evancho made her first talk show appearance on the Tonight Show! Jay chatted with her about fifth grade, cheerleading, and more in the clips below. And of course, she sings another song! When I did my interview of Michael Grimm, a reader of Pure America’s Got Talent asked me to find out if he had a girlfriend. He told me that he did have a girlfriend of about three years. Well, she’s not his girlfriend anymore. Now she’s his fiance. Check out this video of Michael Grimm propose to Lucy Zolcerova on Ellen. Congrats to Michael and Lucy and best of luck in the future! 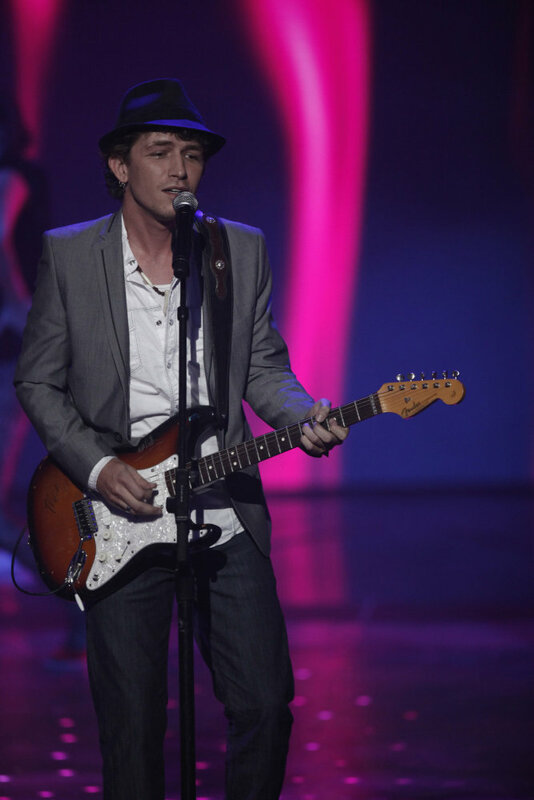 A big Congratulations to Michael Grimm, winner of America’s Got Talent 2010!! As I look at the final 4, I can’t help but agree that Michael Grimm was the most talented person in the top 4. He knows who he is as a singer and the entire season he stuck with what he did well. I honestly don’t ever see Michael Grimm becoming a superstar since he has such a strong niche style. However, he’s going to be very strong with that niche and have tons of amazingly committed fans coming to see him perform. I’m not sure which 3 fascinating acts she meant (maybe the other 3 in the top 4), but it is an interesting observation. Something I bet the producers of America’s Got Talent really don’t like. I’m sure they would have loved for anyone that wasn’t a singer to win. I guess as I think back on this season of America’s Got Talent, I was thoroughly entertained. Although, I think they went a week (or maybe two) too long for my liking. I’ll probably write more about the season later. Not to mention, Marianya is itching to write about the past contestants and what’s going on with them since being on the show. For now, Congratulations to Michael Grimm and I wish you the best of luck!! We’re finally here. This is the final America’s Got Talent 2010 voting. Now that we’ve seen the top 4 perform, it’s time to vote for who you think will win America’s Got Talent season 5. I’m not sure the performance tonight will make that much difference, but I guess we’ll see. So, start voting for your favorite. Well, season 5 of America’s Got Talent is coming to a close. I’m kind of sad about that since it really has been an interesting season. The talent on this season of America’s Got Talent has had more variety and has been more refined and professional than in season’s past. That said, I was right that the top 4 has kind of been a disappointment for me. I’m not sure if it’s the top 4’s fault or AGT for having so many episodes to finally make it to the final. Either way, the top 4 are talented, but the TV show just wasn’t all that exciting for me. Prince Poppycock – Piers is absolutely right to buzz him. Ok, maybe it’s a little distasteful to do it in the finale, but that’s his job as a judge to do it. Prince Poppycock is as much about show as he is about singing. Tonight he chose to take away half of his talent by really just singing. Ok, he gets some partial points for the costuming, but the costuming is really just meant to accentuate and underscore his performance. The song just doesn’t match the Prince Poppycock persona. Two weeks of generally disappointing performances is not looking good for him. Michael Grimm – With singers so much of it is choosing the right song. Michael had chosen good not great songs up until the finale. The songs fit his voice, but didn’t really compel the masses to love him. I think tonight’s song choice was a great choice. It fit his musical style. It had the right amount of energy and excitement that is needed for a show like AGT. Very well done. He should be very happy with his performance. I still have some doubt that his style and genre will have enough mass appeal to get him the win. Jackie Evancho – I thought it was an interesting choice of music for Jackie. Although, I think the music plays perfectly for most of her fan base. As I listened to her tonight I think I was most impressed with her ability to really nail the pitches and create such a beautiful and consistent tone. We’ve seen some amazing kid singers on the show, but one of the challenges they usually have is hitting the right pitches (what people call pitchy) and being consistent in their singing. Jackie has been pretty flawless in that regard and that’s talent. Although, I think her special X factor is that she’s just adorably cute. Fighting Gravity – I was glad that we got another chance to see Fighting Gravity perform after last week’s relatively weak performance. Tonight’s performance was back up to the Fighting Gravity level. I’m not sure the mistake that Piers pointed out will matter that much. I do think they were kind of missing that next level of WOW that would have given them a chance to win AGT. However, Howie is spot on that a black light theater show is going to be in Las Vegas. It will also likely be branded Fighting Gravity. When Terry Fator got to Las Vegas, he worked with some great talent and really took his show to the next level. I think the same thing will happen with Fighting Gravity and it will become one of those must see shows that I tell people who visit me about. I’ll be the first one at their premiere to let you know about it. As you can see, my bet is on Jackie Evancho winning, but as I said in my previous AGT 2010 winner post, it is so close that tomorrow we could be surprised. The suspense will be pretty intense. I can’t wait to see what happens! When we posted this America’s Got Talent Winner poll last week I would have never been able to guess the results that we’ve seen. Usually, there’s a pretty clear cut result in the polls that we post on Pure America’s Got Talent. In fact, you, the readers, are amazing at predicting the outcome. Plus, when I checked this morning the voting was even closer. All 4 of the acts were within 24 votes of each other. This was even after a few thousand votes. Pretty amazing. Let’s just say that this might be the first year that it really is anyone’s game on who will win AGT 2010. Of course, I’m still waiting to see the performances tonight. Many of you may have already seen it and have an opinion. I’ll post mine after I see the acts. Many of you (and us) have been wondering who will be performing on the America’s Got Talent Tour. Well, I got word from AEG (the group that puts on the tour) that they posted the pictures of the acts that will be going on tour on the official AEG website. The interesting thing is that on the AEG website they have the pictures of the entire America’s Got Talent 2010 Top 10. That’s right: Anna and Patryk, Christina and Ali, Fighting Gravity, Jackie Evancho, Jeremy Vanschoonhoven, Michael Grasso, Michael Grimm, Prince Poppycock, Studio One Young Beast Society, and Taylor Mathews. There you have it. The entire America’s Got Talent top 10 will be going on tour. I imagine they’ll do like other tours where the tour will favor acts from that area. For example, when Michael Grimm comes to the Las Vegas show he’ll probably get a few more songs since he’s from Las Vegas. You can see the full list of tour locations below or head straight over to ticketmaster to buy your tickets now. Read more..